How can we detect, measure and deflect them? By David K. Lynch, Copyright 2007 All Rights Reserved. 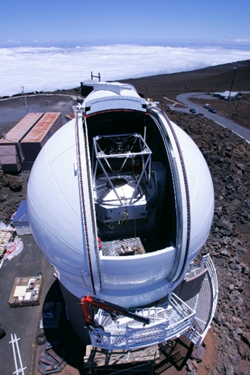 Pan-STARRS telescope under construction on Maui. Image by Pan-STARRS. Used with permission. Can we do anything about an asteroid that is destined to hit the Earth? The answer is, yes, providing that it is small enough and that we have enough time to send a spacecraft to deflect it. As we will see, the longer the warning time we have, the larger the asteroid we will be able manage. Many of the aspects of asteroid impact mitigation were summarized in the Spaceguard Report. More recently, NASA has also completed a study and is being used by congress to decide what steps the US and other nations can and should take. Astronomers have spent a lot of time trying to figure out how to save the Earth from an asteroid impact. First you have to find all the asteroids, calculate their orbits and see which ones come dangerously close to Earth. Once you know the orbit, you can figure out when it will hit. This tells you how much warning time you have. And finally, if you can figure out the asteroid’s mass, you can compute how hard you have to push it in order to change its orbit just enough to miss the Earth. Hollywood’s notion of sending a bomb to “blow it up” is unrealistic because present-day launch vehicles can’t carry a big enough bomb. Besides, instead of one large body, you might end up with many small fragments headed toward Earth. Finding asteroids is relatively easy. The first one was found by Giuseppe Piazzi in 1801. Several observatories are presently dedicated to finding asteroids and tracking them (Spacewatch, NEAT, Pan-STARRS, LONEOS and others). At the present time, about 80% of asteroids larger than 1 km in diameter have been found. None of these have orbits that would bring carry them to a terrestrial bulls-eye. 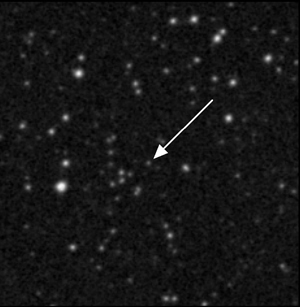 In 2004, a 250 m size asteroid was discovered that is expected to pass close to Earth on April 13, 2029 (Friday the 13th!). Named Apophis, the asteroid’s impact probability is 1 in 45000 and is expected to decrease as the orbit is refined in coming years. Asteroid 1950 DA will come very close to the Earth in 2880. In view of the uncertainties in its orbit, impact remains a possibility. When it comes to asteroid impacts, size matters. Asteroids smaller than about 10 meters in diameter are little threat because they will break-up or burn up in the atmospheres. Those larger than about 5 km in diameter are too big for us to do anything about. These are only estimates because it is mass, not diameter that is important. Some asteroids are “rubble piles”, loosely consolidated collections of smaller bodies held together by the asteroid’s feeble gravity. Others are tough, dense rocks like chondrites and irons. But roughly speaking, the size range that matters is between 10 m and 5000 meters in diameter. So think in terms of rocks between the size of your house and Mt. Rushmore. If an asteroid is found that has the Earth’s name written on it, there is much to be done. Orbits are not known to infinite precision, there are always small uncertainties. Will it really hit the Earth or will it zip safely past us with a few thousand km to spare? (a few thousand km is very, very close!) While some astronomers work to tighten the accuracy of the orbit, others will try to measure the asteroid’s mass. This is tricky. Even in the largest telescope, most asteroids are nothing but pin points of light in the night sky. We can’t see their actual size and structure, only their color and brightness. From these and a guess as to the density of the asteroid, we can estimate the mass. But the uncertainties are too large to mount a reliable deflection mission. So the next step will be to send a spacecraft to the asteroid to measure its mass and other properties like shape, density, composition, rotation rates and cohesiveness. This could be either a fly-by or a lander. Such a mission would also provide extremely accurate orbit information because the spacecraft could act as a beacon or plant a radio transponder on the asteroid. Deflecting the asteroid is the hard part, though the physics is pretty simple. The idea is to nudge the asteroid and change its orbit by a tiny amount. It would typically hit the Earth at around 30 km/s, though this would depend on whether it came in sideways, head-on or from behind. But let’s take 30 km/s as an example. We know the radius of the Earth: 6375 km. If we know how much warning time to impact – say 10 years – then all we have to do is speed-up or slow down the asteroid by 6375 km/10 years, or about 2 cm/sec. An asteroid 1 km in diameter weighs about 1.6 million tons. To change its speed by 2 cm/s requires more than 3 megatons of energy. Safety depends on finding the asteroids as early as possible. Obviously, the more warning time you have, the easier it is to make the change because you don’t need to push as hard. Or you can delay pushing while you refine the orbit or develop technology. Alternatively, a short warning time means you have to get busy and push as hard as you can. Early warning is the best approach. As the saying goes, "A stitch in time saves nine." Comets are the wild card of the terrestrial impact game. They are usually only discovered a few months before approaching the inner solar system. With diameters of a few kilometers and speeds up to 72 km/s, they represent a potentially unmanageable threat. With less than a few years of warning, there probably would not be enough time to mount a deflection mission. The spacecraft was intentionally crashed into the nucleus of comet Tempel 1 at around 10 km/s. This was the result. July 4, 2005. NASA Image. There are several ways to deflect asteroids, though none have ever been tried. The approaches fall into two categories – impulsive deflectors that nudge the asteroid instantaneously or within a few seconds, and “slow push” deflectors that apply a weak force to the asteroid for many years. Impulsive deflectors come in two varieties: bombs and bullets. Both are within current technological capabilities. By setting off a bomb on or near the asteroid, material is blown from the surface. The asteroid recoils in the opposite direction. Once the asteroid’s mass is known, it is easy to figure out how big of a bomb to use. The biggest explosive devices we have are nuclear bombs. They are the most energetic and reliable means of delivering energy and therefore nuclear deflection is the preferred approach. Nuclear bombs are hundreds of thousands times stronger than the next best approach; bullets. The “bullet” approach is also simple. A high speed projectile is rammed into the asteroid. At present we have the technology to send a bullet weighing a few tons into an asteroid. If the speed were high enough, this approach could yield pushes several times larger than what would result from the impact alone because material would be blown off the asteroid in much the same ways as a bomb does it. In fact, the bullet approach – “kinetic deflection” as it is called – has actually been tried in an indirect way. 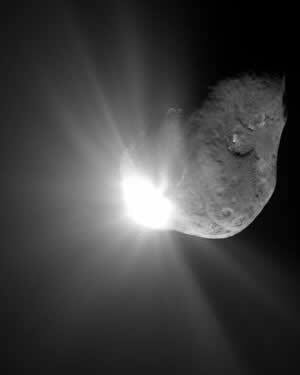 In 2005, NASA’s Deep Impact spacecraft was intentionally maneuvered into the path of comet Tempel 1. The purpose was to punch a hole in the comet and see what came out. And it worked. While the change in the comet’s velocity was too small to measure, the technique proved that we can track and successfully target an asteroid. Slow pushers are largely conceptual at this time. They include: ion engines, gravity tractors and mass drivers. The idea is to transport the device to the asteroid, land and attach to it, and then push or pull continuously for many years. Ion engines and mass drivers shot material at high speed from the surface. As before, the asteroid recoils. A gravity tractor is a controlled mass that stands off from the asteroid using something like an ion thruster. The mass of the tractor pulls the asteroid using its own gravity. The advantage of all slow pushers is that as the asteroid is moved, its location and speed can be continuously monitored and thus corrections can be made if necessary. Ion engine attached to the surface of an asteroid. NASA Image with illustrative edits. Attaching something to an asteroid is difficult because the gravity is extremely weak and the surface properties may not be known. How would you attach a machine to a sand pile? Most asteroids rotate and thus the pusher would be whipping around and seldom be pointed in the right direction. It would also have to rotate with the asteroid and this takes energy, lots of it. While the gravity tractor does not suffer from these drawbacks it does need a steady source of power. All these devices are complicated. They must be powered, controlled and made to operate remotely in space continuously for many years, a very tall order. 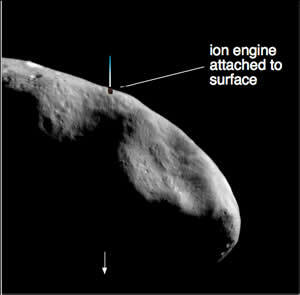 We have demonstrated that ion engines can work for at least a few years in space, but so far ion engines do not have enough force to deflect a threatening asteroid unless there is an extraordinarily long warning time. The down side of long warning times is that uncertainties in the asteroid’s orbit make it impossible to be sure it will hit Earth. There are a few far-out slow-push concepts: painting the asteroid white and letting sunlight exert radiation pressure; putting a laser in orbit and zapping it many times; pushing a smaller asteroid close enough to deflect it gravitationally. When astronomers run the numbers, however, the ideas fall short of any practical system. Astronomers are not the only people worried about asteroid impacts. Politicians, emergency response organizations and the United Nations are all concerned. If we have to deflect an asteroid, who will pay for it? Who will actually launch the spacecraft? If nuclear bombs are the surest way of deflecting the asteroid, do we have to keep nuclear bombs on hand? Will other nations trust the US, Israel, Russia or India to put nuclear weapons into space, even for a humanitarian mission? What if the asteroid is headed for Geneva and we only have the means to shift the impact location by 1000 km. Which direction do we choose and who decides? Can we be sure of performing a precise shift with untested deflection technologies? If the asteroid hit is unavoidable, what do we do? If we know where it will strike, do we evacuate people from the area? How far do we move them? If the impact debris remains in the atmosphere, global cooling could occur. Who is in charge of world food supplies? If it will hit in the ocean, how big will the tsunami be? How can we be certain that the devastation we predict is correct or that we have not overlooked something? Perhaps most troubling of all, asteroid impacts are a whole new kind of disaster: how do we prepare for the destruction of (say) the eastern US when we have 20 years of warning? These and other questions are being discussed today in scientific meetings all over the world. Fortunately, the chances of even a small asteroid hitting the Earth in the foreseeable future are very small. Learn More: Near-Earth Asteroids: What are they and where do they come from? David K. Lynch, PhD, is an astronomer and planetary scientist living in Topanga, CA. When not hanging around the San Andreas fault or using the large telescopes on Mauna Kea, he plays fiddle, collects rattlesnakes, gives public lectures on rainbows and writes books (Color and Light in Nature, Cambridge University Press) and essays. Dr. Lynch's latest book is the Field Guide to the San Andreas Fault. The book contains twelve one-day driving trips along different parts of the fault, and includes mile-by-mile road logs and GPS coordinates for hundreds of fault features. As it happens, Dave's house was destroyed in 1994 by the magnitude 6.7 Northridge earthquake.